Easy hygienic access for trash disposal. 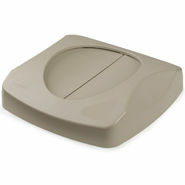 Swing lid design provides easy access and quickly returns to hide refuse from public view. Controls liter, odors, and insects.